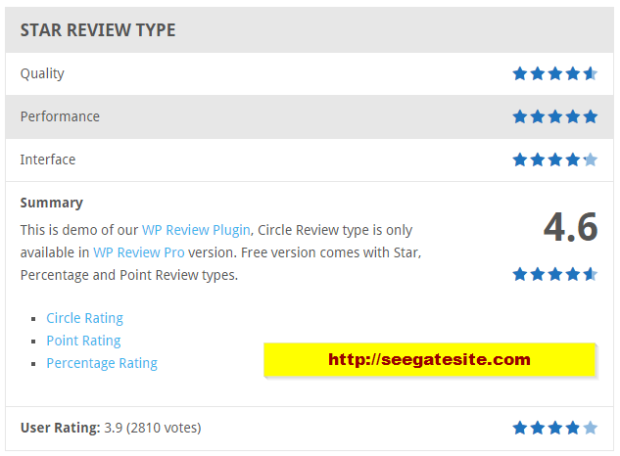 Programming Tutorials – seegatesite.com will share an articles about best wordpress review plugin, WP Review. In order to provide value or a measure a product based on a number on wordpress, requires a plugin that can help us to realize them. With the help of free plugins or premium plugins, a wordpress site can be a powerful and multifunctional site. WP Review is a best choice, in addition to free, wp review is also a lightweight plugin that doesn’t reduce your site’s speed. WP Review is a premium wordpress review plugin made by MyThemeShop, which is distributed free of charge to wordpress community as gratitude. We have been given so much by the WordPress community, it’s time to give back. With this plugin you can also improve user interaction on your site to rank each product / service / something else. Or maybe you’re running your affiliate business that can help visitors to give a detailed review. This is the best way to increase sales of your business. Supports Shortcode to show review anywhere in post. How to use WP Review plugin ? Install WP Review plugin from plugins menu (Plugins > Add New). 1. Review Location : We can choose which review will be placed. 4. Heading background color : background color of even row. 5. Background color : background color of odd row. 6. Border color : Border color. 7. Default feature : We can add default review parameter here. Save these default setting then create new Post, you will find WP Review menu on the bottom text area content. Its easy right using wp review to improve your wordpress appearance ?